B.S. 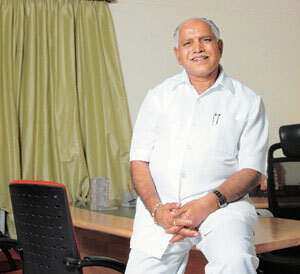 Yeddyurappa > BSY's Photos > CM returns from China. Bangalore: CM B.S. Yeddyurappa landed in Bengaluru today around 2 am from China after participating in World Economic Forum meetings as a prominent invitee from India. Home Minster Dr. V.S. Acharya received him at the Bangalore International (BI) Airport. Talking to pressmen, CM told that it was a fruitful trip and beyond his expectations. He express happiness over BJP winning a seat in by-elections to Assembly from Congress in Kadur. He would find out what went wrong in Gulbarga (south) contest. On Ramachandre Gowda’s resignation, CM stated that he would accept the letter and forward it to the governor, in reply to a scribe’s question.